Light breeze forecast with it dropping off later but hopefully the tide would be favourable for us. Kite up at the start, after sorting the pole out (note to foredeck; check before start), and by the time we got level with Snowden looked pretty good on the fleet. Usual split with some boats going further North but we all came back together fairly close at No Mans Land. Decided to drop the kite at St Helens with some boats keeping them up for the leg to Winner so lost out to Polly and Blazer but not that much. Once round Winner it was a beat all the way back to the finish and the main plan was to get in the strongest tide ASAP and stay in it. Polly headed off into the distance with no chance of catching her but had a good dice with Blazer and got back in front of them after the first long tack and maintained the lead to the finish although it was pretty close at the death with only 7 seconds between us. Also managed to keep close enough to Alchemist to get time on them and Xara too so came out 3rd overall which was pretty pleasing. 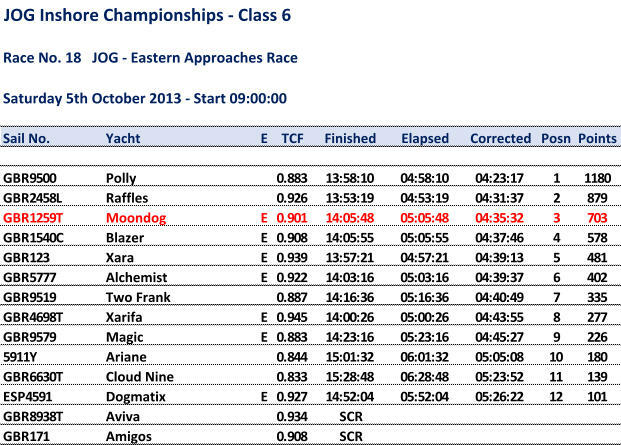 The result also moved us up from 9th to 4th in the overall championship.